Mitsubishi Electric and their ductless mini-split heat pumps allow you to enjoy total comfort control in any room, at a fraction of the operational cost of a conventional HVAC system. These small units are far more efficient, as they only use the exact amount of energy needed to maintain comfort in any given room. This form of ductless heating and cooling allows for unlimited installation options and flexibility. These systems also feature a multi-stage allergen filtration process, guaranteeing you and your family the cleanest, healthiest air. Mitsubishi mini-split systems are easy to install, and thanks to the ductless air conditioning and heating design, maintenance is a breeze. These systems have a small outdoor unit and a small indoor head that can be placed almost anywhere. Fred’s frequently installs Mitsubishi ductless heating and cooling systems in three-season rooms, home additions, or in rooms in your house that have difficult temperature regulation. 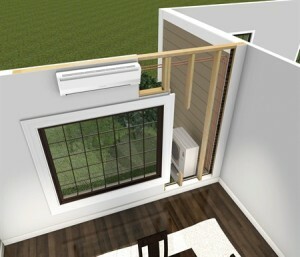 Interested In Ductless Heating and Cooling? The team at Fred’s Heating and Air has vast experience in the installation and maintenance of ductless heating and ductless air conditioning units. If your home is older and you don’t have central air or ductwork installed, don’t worry. We won’t put you through the hassle and expense of converting to a new system. We can integrate ductless heating and cooling in your home, including Mitsubishi Electric solutions.